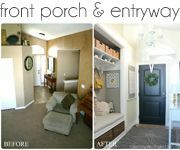 I had en entryway like this? So much more decor and things to add, but I just couldn't keep it a secret ANY longer! I HAD to share! 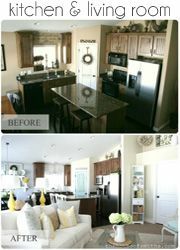 Check out my other posts here and here for table, and chandelier how to's! LOVE the chandilier too! 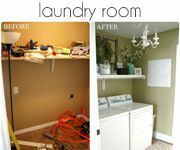 Still on the hunt for one for my laundry room, what a fun swap! Btw, received my vinyl, thanks again!! Ooh gorgeous!! So nice and bright and clean looking! I love seeing the difference. It look so much more open and inviting. Good job!! Oooo! So fresh and white and gorgeous. I absolutely love it! I ought to have you come over and redo my entryway. I almost did a post today about how irritated I am with it. Maybe I'll take some cues from yours. Love it! I love the transformation! It is gorgeous. I have the same thing...I blog and blog, and I wonder "Is anyone really reading this?" 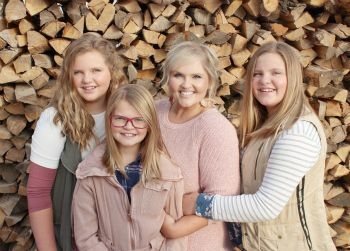 I don't get many comments and just started my new blog, so I think it's a lost cause. Then I run into people that I personally know and they say stuff like "I love your blog...etc." So..I linked over because of the ironing board tutorial, but stayed now for an hour loving all the stuff you've done to your house. My husband and I are in the process of buying our first home and MAN you've got some great ideas and style. I'll be following you...not to be creepy, but really beautiful changes! Hey Shelley! I absolutely love the new look in your house! 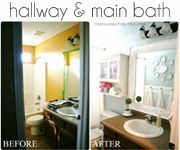 Question for ya...I can't remember if you posted it or not, but I was wondering what the paint color is in your girls bathroom? If you get a chance could you let me know? Thanks! I love it! You did a great job. I think I want that paint color for my bathroom. Please share!! Wish I knew how to design blogs myself, but mostly I've just found wonderful ladies who know how and are willing to share. 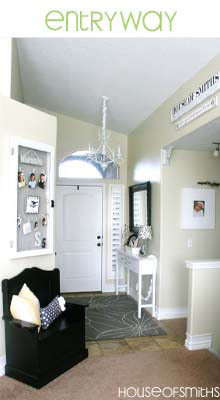 What a great blog.You have some lovely ideas.I have just been inspired to get on & start decorating our Victorian home. I'm pretty sure you are my new best friend. Just found you and your blog. Awesome blog. Am following now. Love the crepe paper rose balls. PS you need to add your email address to your commenting so I can respond back to your comment. Hi there just found you and I just love your entry! Its like a new home, amazing! I love that wreath! Where do I find it!? I love your wall color! You're going to have to spill the beans! What color is your entry wall. I love it! Okay, where did you get that adorable chunky flower in your entry way? Or did you make that too? I've got to know!